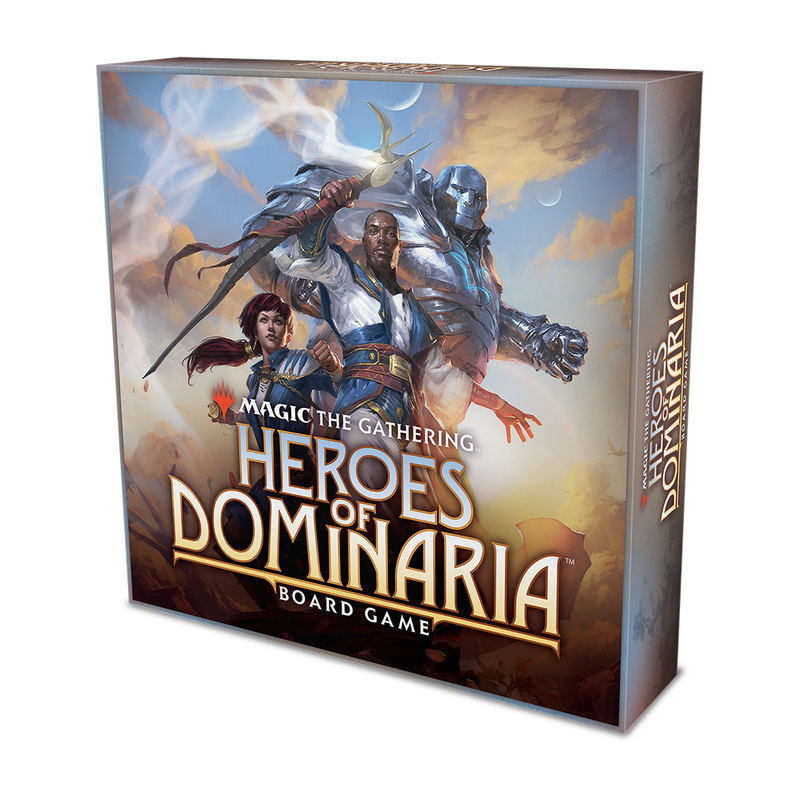 Magic the Gathering: Heroes of Dominaria Review — GamingWithSwag.com - Dads By Day, Gamers By Night. When I was a kid there were a few pivotal experiences that lead to my life long love of gaming. A friend in first grade told me how his family played a game called Dungeons and Dragons. We would “play D&D” every day at recess in the proto-LARP sort of way that kids play. One year on my birthday I received a massive 3-D board game called Fire Ball Island and it showed me that board games could be more then Monopoly. I could list off a lot more of these moments, however, there’s one event that all the others pale in comparison to. It’s the early 90’s and I’m coming home from the super market with my Mom. In my hands I hold a generic geek magazine who’s name I’ve long forgotten. I had begged my Mom to buy it for me because the cover promised a tell all X-Men family tree. I was very excited to find out if Cable was Cyclops’s long-lost son (he was), but it was an item in the magazine’s Christmas gift guide that caught my attention and never let go. The entry was about a card game with mysterious looking art wherein powerful wizards would summon creatures and cast spells. In this game you made your deck out of cards that you collected and every deck was unique. The article ended by saying that it would be no time at all until you were trading your Lenny Dykstra card for a couple of Drudge Skeletons (it took me years to find out that Lenny Dykstra was sports person and not a battle wizard of some sort). This game was Magic: The Gathering and I was in love with it from the moment I saw it. Flash forward about 25 years. I’m still in love with Magic and completely enthused to hear that WizKids is putting out a board game based in the same universe. The game of Magic is filled to the brim with all sorts of fantastic worlds and characters, each one represented by a beautifully illustrated piece of art. Many cards have little snippets of text whose only purpose is adding flavor to the game. These tantalizing words point to a bigger story that you piece together as you see new cards. If there was any property that could use a rich thematic game to make you feel like a wizard (or Planeswalker as the players are called in this world) then that property was magic. Unfortunately, Magic: The Gathering Heroes of Dominaria does not do a good job at this. When I played my first game of Heroes the term “pasted-on theme” came to mind. This game has names of things from Magic and art from the cards but besides for that the theme could have been wizards dueling or building train routes or 10 other things. The game is a fail when it comes to theme, but I wanted to bring this up first to get the bad out of the way, because everything else about this game is just great! In Heroes each player is a powerful mage called a Planeswalker. 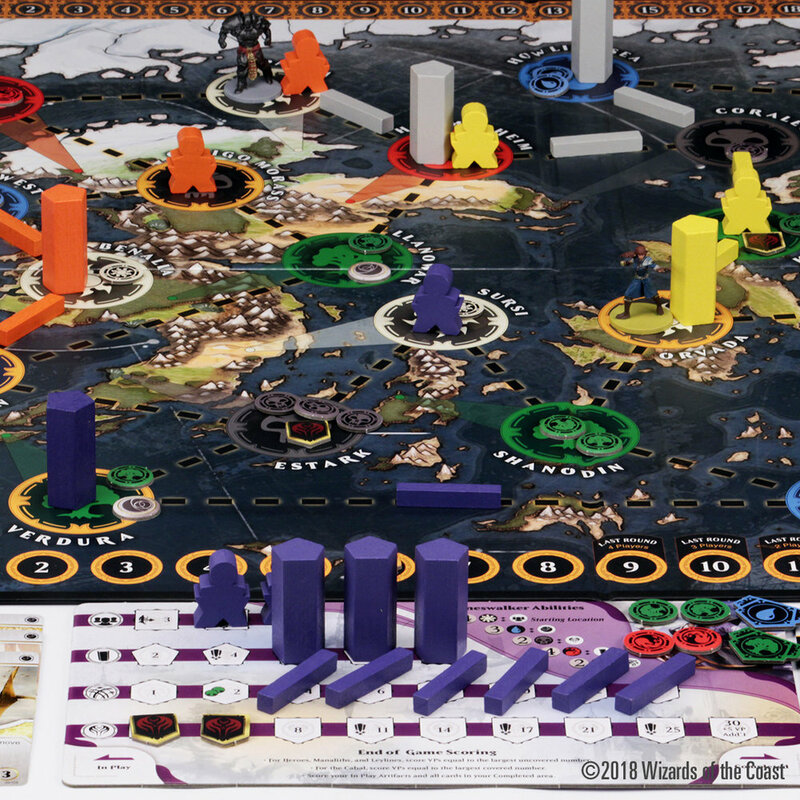 The goal of the game is to collect the most points by end game through building structures, defeating cabal tokens, and find ancient artifacts. Each turn has players moving their agent pawns around a map of cities connected by pathways. Players then collect all mana tokens, which are placed on the board through a card drawn at the start of each turn, from one of the spaces they land on. Players can use these mana tokens to do various actions. These actions involve building structures that aid with mana collection, putting more agents on the board, beating up cabal tokens that block mana collection, and discovering artifacts that give you powerful abilities. You also get points for doing these actions with a bigger reward coming the more times the same action is done. In addition, there are also quest cards, both public and private, that you can cash in for points by meeting the requirements on them. Heroes is both surprisingly quick to play and easy to learn. I say surprisingly because the game has more strategy then it’s light exterior would clue you in on. The personal quests are a nice set of sign posts guiding your way but honestly you could also just ignore them and try to build as much as possible from your player board. The artifacts you collect and distribution of mana on the board can also have a big impact on your game plan. Now I know I said that the game is a little week when it comes to theme but that doesn’t mean it’s a bad looking game. Seeing art from Magic cards on a different style medium is kind of a disconnect but it’s still beautiful art. I also really dig the, almost, minimalist design that the main board and components have. Each of the different structures you can build have a fantastic tactile feel and are a delight to place on the map. All in all, Heroes is a great game! It’s got quick streamlined gameplay, great art, and quality components. If you have no interest in Magic: The Gathering, please don’t let that scare you off! I say that about a lot of games based on specific properties, but it holds doubly true here. Out of the ten or so people I’ve played this with only one had played Magic before and the theme had zero impact on their experience. While it doesn’t hold the same place in my heart as Magic: The Gathering, it definitely won’t be leaving my collection any time soon! Gameplay – Easy to learn and quick to play with a nice amount of strategy. Rulebook – Well written with plenty of examples. Theme – Unfortunately, it just feels completely disconnected from the parent setting. Outside of names and art in common, there aren’t a lot of things that make the theme pop. 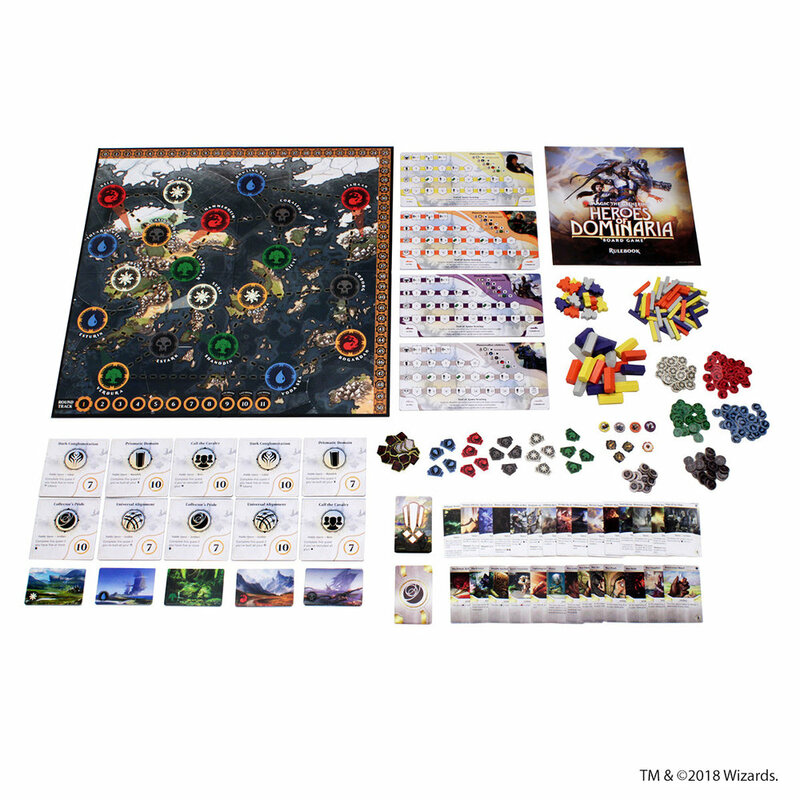 Set-up/Take down – Putting all the mana tokens on the map and the structure on the players boards is mildly cumbersome, but altogether not bad. Components – Everything here is a very good quality, especially the player structures. I also can’t stress enough how atheistically pleasing the design is. This game is a pleasure to look at!